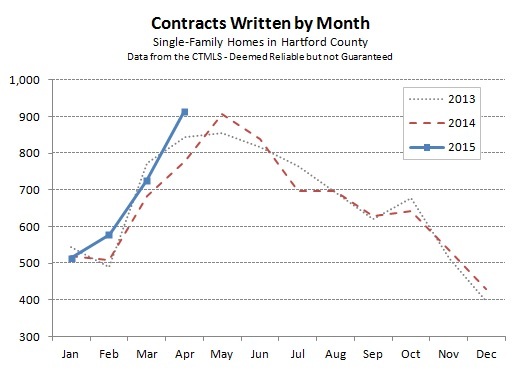 Hartford County finished May with 943 single-family home deals coming together. The month was 4% more active than May of 2014, and it took over from April of this year as the most active month since we began tracking contract data in 2009. May is traditionally the peak month for contracts in the cyclical real estate market, so we expect that the sales pace will begin to slow as we enter the summer months. Not all the towns in Hartford County were moving full speed ahead in May. 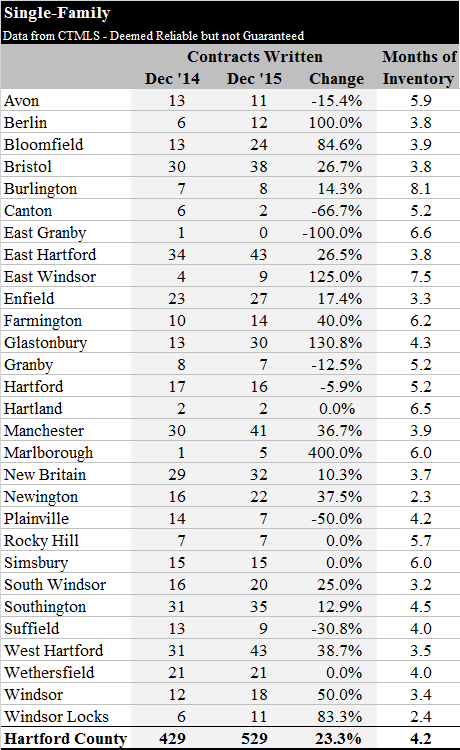 In fact, four towns had noticeably fewer deals than than their comparison month of May 2014. 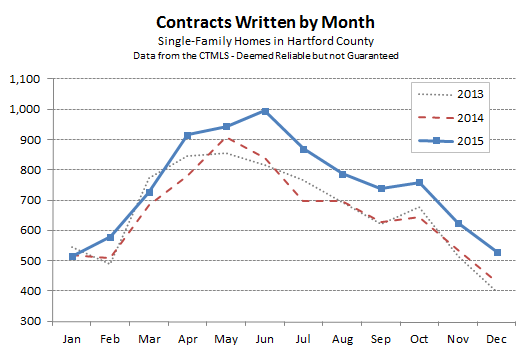 Enfield, Hartford, Southington, and West Hartford all showed at least 10 fewer deals than the previous year. 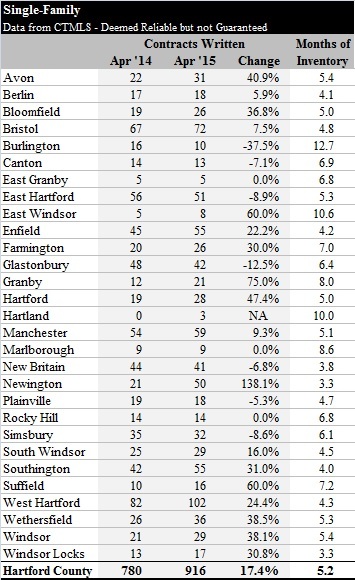 On the other hand, four other towns significantly outperformed their May 2014 comparison month. 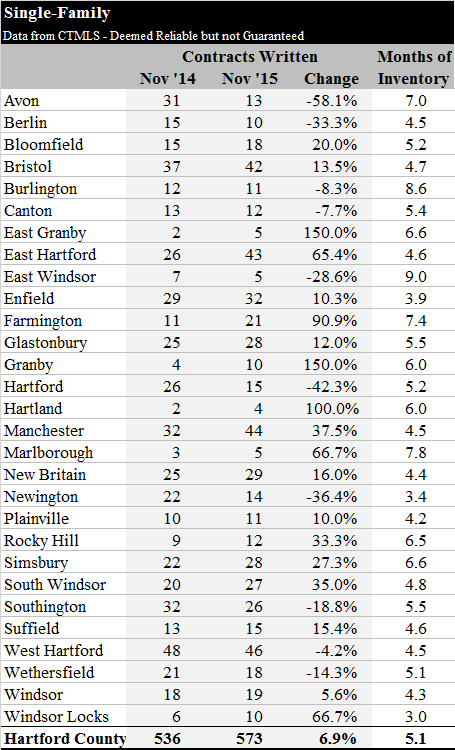 East Hartford, Glastonbury, Manchester, and South Windsor all reported at least 10 more deals than the previous years. 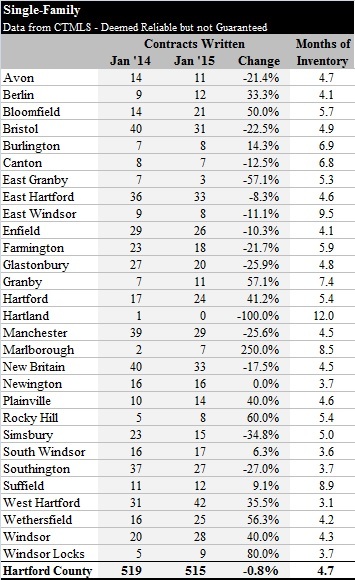 Other towns with smaller real estate markets actually showed greater improvement when looking at the percent change. Inventory increased to 6 months worth of homes on the market, up from 5.2 in the April report. This suggests that the pace of new listings was even greater than the pace of buyers and sellers agreeing to contracts. The MLS shows 1,626 Hartford County single-family properties with a May listing date. As a point of comparison, there are a total of 4,105 active listings. 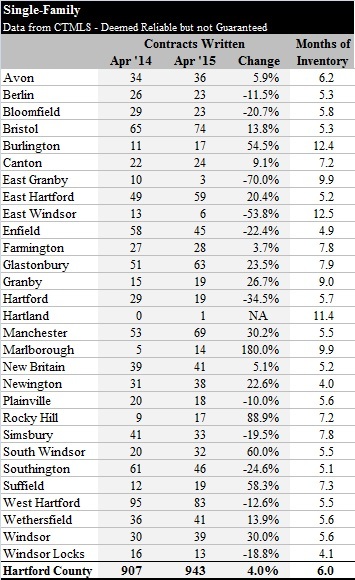 Hartford County just completed the most active month in years, narrowly edging out May 2014. The single-family deal count represented a 17% increase over the number of deals observed last April, and on a year-to-date basis the County was about 10% ahead of 2014. Earlier in the year we noted that people seem more interested in real estate than they had in quite a while. These numbers begin to quantify the anecdotal observations. Closings, as they happen in May, June, and July, will be the final confirmation of just how the spring compares. So far, so good. Looking at the individual price bands, much of the increased activity came from the most active parts of the market. There was a 22% jump in the number of contracts for homes with asking prices in the $200,000s, which represented 132 more deals than the year-to-date count in 2014. Increases were closer to the high single digits in most of the other price bands. Contracts traditionally peak in either April or May. The spring peak has been May for the past several years … which suggests the County could do even more deals this month? At this point we have not seen any warning signs to make us think the market will slow down, so we’ll just have to wait and see. 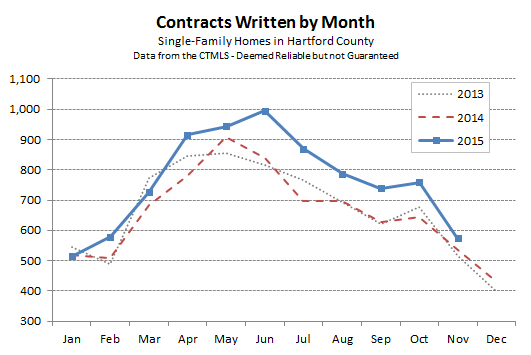 The 515 single-family contracts observed in Hartford County this January put the market in line with recent history. There were 519 deals that came together last January, and 544 the year before that. A new year always feels like a fresh start. For us as agents, it’s a clean slate and fun to get back to work after the holiday season. Buyers also seem more engaged in January, even if they are hoping to make their purchase later in the spring. This is the right time for them to meet with their agents to establish a strategy and make sure they are properly prepared. Most sellers see the spring market as the ideal time to list, and this is a good time for them to prepare their property for the market. During the first quarter of the year, the real estate market often trends with the weather. Big snow storms will slow things way down for a day or two until the streets are clear and the kids are back in school. If Mother Nature strings a few storms together, then sellers start to think more seriously about the timing of listing their home for sale. Our sense is that the market seems healthy. 2014 results were similar to 2013 results in many ways as the market looks to establish a new normal activity level. It does not seems like there are widespread imbalances between supply and demand, so we expect a steady real estate market this spring. As always, we’ll be on the lookout for trends and events that could change the local dynamics. Please call or write if you have questions, or are looking for an agent to help with your real estate needs.